Email marketing new home construction to real estate agents is a very unique breed of communication, with complex and sometimes confusing methods to reach success. Performance from campaign to campaign can vary dramatically, with top eFlyers driving 3 times the open rates of less successful ones. Therefore, it's important to examine what makes a successful email campaign to ensure the best return on your advertising investment! 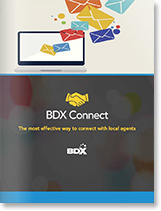 The BDX Connect team delivers hundreds of email flyers to real estate agents across the country each month, helping home builders to promote their communities, co-broke specials, and agent events to this very engaged audience. As a new effort in 2017, we've decided to begin sharing this information on our blog so you can benefit from our team's expertise on this very specific type of marketing. 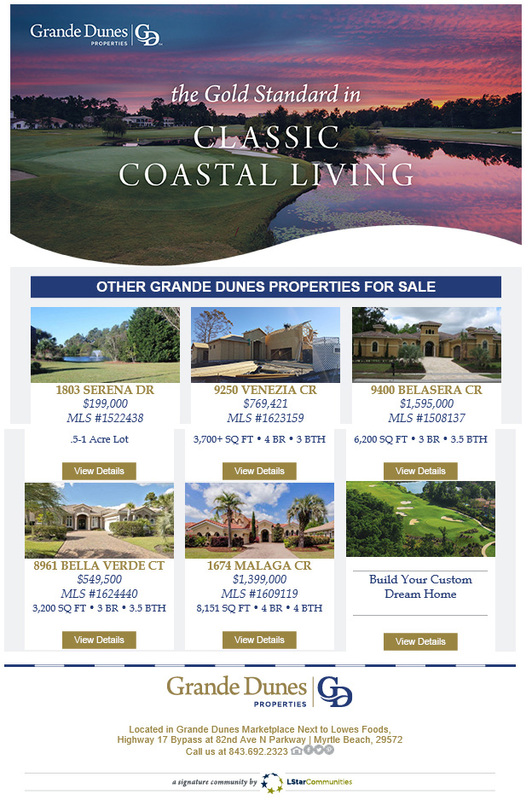 From our eFlyers sent in January, we examined several campaigns that had open and click rates up to 40% higher than our averages to get a sense of what made these campaigns successful, and the results are below. We will continue to post our findings through 2017, and love to hear from you regarding this data! Please email us at connect@thebdx.com with any comments. The first thing you see in any email is both the Subject Line and From Name, so we must make sure they will provide information to the receiver that will invite them to open and read the content of the email. The "From Name" must be easily identifiable by your agents, which helps avoid the email being sent directly to the spam folder or ignored, so we recommend using the Company or Community name as seen in the examples throughout this article. The Subject Line is another click-to-open item to consider, so it's best to summarize the main content of the email in 50 words or less so readers know what to expect from it. Citing the benefits within the body or rephrasing the company or community's name is another best practice to consider. 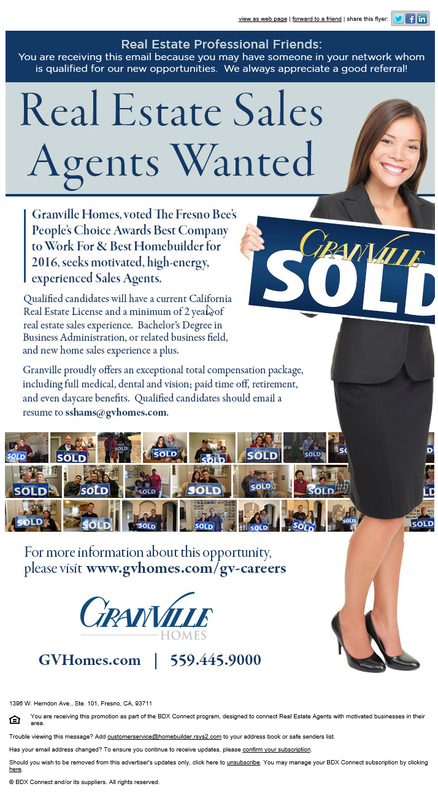 #2 - Granville Homes Subject Line: Real Estate Sales Agents Wanted! When opening the eFlyer, agents will decide rather to read the content or not based on the email's main image or header, which serve as the introduction of our eFlyer. We advise to use clear text that will contrast the selected photo to catch the eye's attention, or a big, outstanding font if no illustrated source is used. If there is any promotion or benefits included in the contents, naming them in few words will also invite them to read more to learn how they're able to achieve these. The image should represent the community or body of the email, and it should work as a link so that agents can click and open to see more photos related to the one being displayed. Less is more when it comes to the header, so try to only include "who", "what", "where" and "when" in this first section. 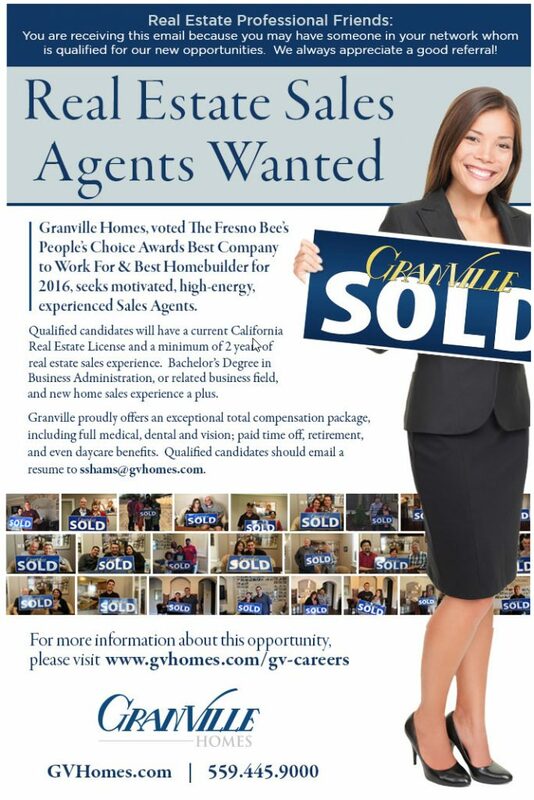 All further details can be described below in the body of the email where agents can get more information if interested. Another important aspect to take into consideration while setting or designing an eFlyer are hyperlinks. Links can be found in images or text, but it's important to let the customer know these are click-through items. Selecting a different font color, underlining or bolding the text, and/or adding text to the image to invite the agents to click on it are some ways to achieve this. 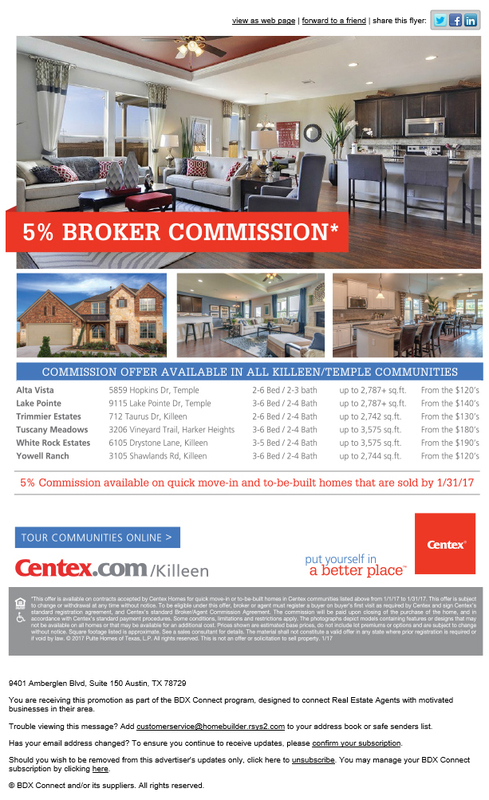 Also, M/I Homes' inventory eFlyer demonstrates that the size of the email doesn't really affect it's performance thanks to a clear subject line and from name and a summarized header that gives information of the content that follows. The body of the email contains information of the available move-in houses in a constant and easy to read format. 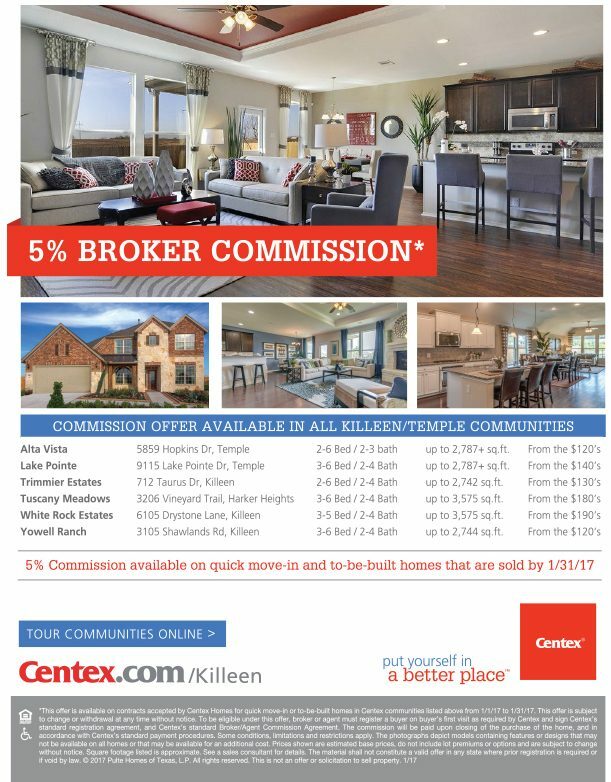 #4 - Pulte | Centex Killeen Subject Line: 5% Broker Bonus at Killeen and Temple Communities thru 1/31! The "Call-to-Action" or CTA button is one of the most important elements within an eFlyer. This is the button that invites the agent to learn more about your community, RSVP or register a promotion. The button must use bright colors and clear text to stand out from the rest of the content. Also, try and avoid including it in the main header so the agent can read more about what you're trying to share with the eFlyer; but always include the main link in the main image. 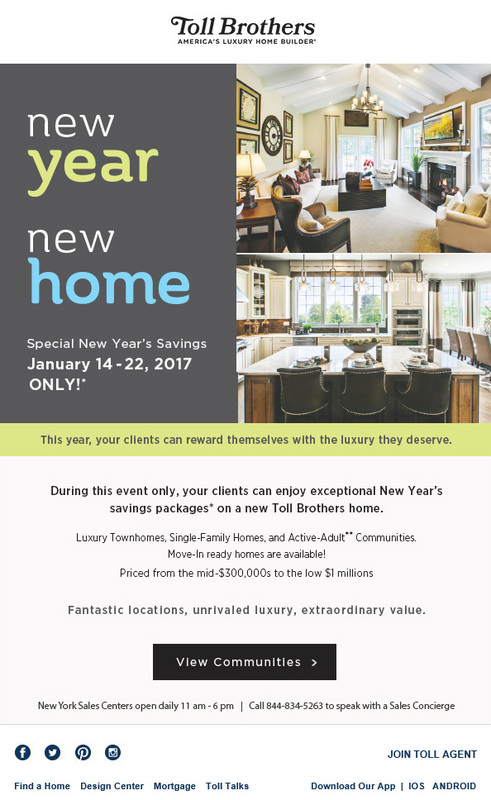 #5 - Toll Brothers - New York Subject Line: Your clients can enjoy special new year's savings on a new home! Design is also important. Bright colors will guide the reader where to read first. Font size will dividing the different sections on the content so the reader is not confused or lost.